“To use it, you have to spread it.” This simple concept, developed by Penenberg, is just one of the social networking tips that he has to offer when it comes to marketing a new business or product. What it means is that if you have made the decision to base your marketing plan on a particular social media site, you must let the public know about it and use word-of-mouth. The word-of-mouth strategy is one of the most useful tools that a company can use. As Penenberg states, “Word-of-mouth is the most important form of advertising, and it’s free.” Not only is it easy on your budget, but to a potential customer it is the most trustworthy form of communication. People rely on their family and friends to get reviews and information about products, places and people. If a company can get positive word-of-mouth out in the public, their response rate will be quite successful. When used effectively positive word-of-mouth via social networking sites can be the sole aspect of a particular marketing strategy. Penenberg uses the term “viral coefficient” to track the number users are brought in by existing users. For example, a coefficient of one means that the growth rate is linear. The larger the coefficient number gets, the faster the growth rate speed is. Because of the vast number of social networking sites on the Internet now, it would be almost impossible to not be able to find one that could efficiently reach your target audience. Whether you’re basing it on gender, income, or race, there is a networking site out there for your market. When you are able to successfully market to your desired target audience this also expedites the growth of a company or product. From Fortune 500 companies to grassroot non-profits, using the power of social media can create and establish an image with audiences and potential customers. Those that do not use the viral networks are seen as old fashions and not up to date with the modern technology compared to others. To make sure that audiences are getting your message clearly companies need to make sure that their social networking sites share these same characteristics; web based, free, user friendly, simple content and layout, and fast adoption. Penenberg found that when these characteristics are put into action they create the most effective and successful “viral expansion loops.” Some examples that match these characteristics include two of the most popular social networking sites on the web; Facebook and Twitter. Both have very simple designs and user friendly features that are easy to learn. Once the social networking site has been established it is vital that people actually hear about it. Penenberg suggests using emails and lots and lots of networking. First, emailing is a fast and free way to get the word out about your networking sites. It also makes it very easy to forward the information to friends and family who may be interested, thus using positive word-of-mouth. Going along with this, is the concept of networking and using those contacts to your advantage. By letting those people that you have networked with before they pass along your information to their network and so on and so forth. This generates a snowball effect that is directing all traffic to your company and product. From a public relations perspective Penenberg’s advice can be applied to all sorts of things, including creating an image for a person, place or product, controlling a company crisis, or even the simple news release. Social media can help generate interest for all for these situations. For example, a company can use their Facebook account to make sure that their online customers are satisfied with their service and/or product. Facebook makes it very easy to do this because the format is easy to use and a huge number of people use it. Facebook’s comment feature is also very helpful to give customers instant feedback and responses. Twitter, the other leading social networking site, is also very simple and user friendly. Both Facebook and Twitter allow companies and public figures give audiences updates on upcoming events and important news. 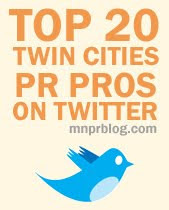 PR professionals use social networking sites all the time to stay updated on the wants and needs of their constituents. In today’s society public relations, marketing and social networking all go hand in hand, working with one another and helping each other out. Penenberg provides some great tips for people looking to start businesses, but his advice also works well in the general sense. I think that the most important piece of information that he expands on is the idea of “to use it, you have to spread it.” This is true because if you have a social network site but no one knows about it, you might as well not have one at all. Getting the word out about your site is crucial in starting that snowball effect of new audiences and customers. PR skills, like networking with other professionals, makes this step easier if you have built up a contact list of people that would be interested in your site. “The Viral Loop” is a must read for gaining insight into the world of social networking sites and their relationship with companies and products. The relationship that these sites have with each other can be used to properly market a certain brand or person, and they not only help out with marketing but they can be used by PR professionals. With each passing year there are going to be more and more social media sites added to the already incredibly long list, making the viral loop that much larger.